National Library Week Tip #4: Don't forget about debut authors when searching for books to read. My grandfather has told me stories of how he put pennies on the train track and waited for the passing train to squash them. Steam trains were a common sight when he was a youngster, their tracks crossing all over the country. Today kids are lucky if they get to see one up close in a museum. Fran Cannon Slayton takes young readers back to the time of steam engines and small railroad towns in her debut novel, When the Whistle Blows. Setting her tale in the 1940’s Rowlesburg, West Virginia, she tells the coming-of-age story of a boy named Jimmy Cannon and his experiences growing up in a railroading family. Jimmy is all boy, full of mischief, pranks and curiosity. Throughout his young adult life, Jimmy tries to figure out and understand his father, the foreman of B&O railroad, the man with varying snorts depending upon his mood. Jimmy desperately wants to have a part in the railroader life, just like his father, brothers, and uncles. Railroading is in his blood after all. His father urges him to look beyond the railroad – the steam engines are on their way out with the less-maintenance diesels taking over. Jimmy also searches for the meaning behind the secret society that his father belongs to and learns the value of having friends you can lean on during hard times. Slayton tells Jimmy’s story using an unusual style consisting of a series of vignettes, each chapter taking place in consecutive years (from 1943 to 1949) on the same day-of-the-year, All Hallows’ Eve. In these story snapshots, the reader observes Jimmy as he struggles through and learns from various life-altering events all the while progressing from boyhood to manhood. The use of dialect with terms like ‘em, lemme and gonna lend realism to Jimmy’s voice. Seamlessly included are all those topics so interesting to boys like engines, cars, hunting, and football. Slayton brings a whole lot to the table in this book, and though she recounts some humorous stories, many topics are fairly heavy: death, complex father-son relationships, coming-of-age struggles, railroad history, issues faced by those living in small towns, and the paralyzing effects of mass layoffs to a small community. Amazingly, somehow she manages to write about these subjects with touching innocence and realism all marvelously depicted through the eyes of a young man. I will caution that a few of these events warrant further discussion, especially with those readers of an impressionable young age. Because of the structure of the book, we do not see Jimmy’s character held accountable for his questionable actions. While Slayton implies that Jimmy’s father is rather strict, Jimmy sneaks about during the night, throws frozen cabbages at cars (such pranks could cause severe injuries) and seemingly gets away with it. In some of the scenes adults drink beer and smoke, though not to excess and football fans bring pint flasks to football games. However, in my opinion, the way Slayton brings out these genuine character qualities and all their imperfections makes this book such a true-to-life, outstanding read. Given my mechanical engineering background, I found the references to steam locomotives and the impact of dieselization most interesting. The loss of jobs aspect in the book is very relevant today given the struggling economy and mass layoffs that have impacted so many. Train buffs will find a lot to love about this book. Slayton knows her stuff; she grew up in a railroading family and the pride she feels blasts through the pages of her book with strength and clarity like the whistle on a steam train. Slayton hopes that her book will help revitalize Rowlesburg, a very noble dream. In fact, due to her remarkable story, I now have a newfound desire to ride a steam train someday, just for the experience. Mid-Continent Kids: What Makes A Steam Engine Work? Win a copy! 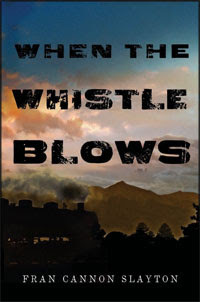 Fran Cannon Slayton has kindly offered to giveaway (2) advance copies of When the Whistle Blows to Brimful Curiosities readers. To enter, check out www.francannonslayton.com and let me know why you think you'd like to own her book. • Contest ends on Monday, May 4th, 2009 at 11:59 PM CST. I must say that with the setting being in the past and on trains how could I not love it? The book really does sound captivating. When I was younger, I was fascinated by the train that ran near our house. We used to go put pennies on the track all the time. I'd love the chance to read this! I'd love to win this book. My grandfather worked on the railroad in the30's. I am also interested in the 40's. I wouldn't want to live during that time but I like reading and hearing stories aobut that time period. I would like to own this book because it sounds like I could learn something about the era when the steam locomotives were still popular. The characters sound interesting also. Please enter me....I know about this book but haven't read it. Would love to win. I am a follower! Thank you! I grew up getting to ride the steam train in North Freedom, Wisconsin, and now live near the National Railway Museum so my kids get to ride every summer! Took the library's summer reading program there one year. THAT was an adventure! I may be a Yank, but I've got relatives in the South, y'all, and I love to read a good Southern dialect--and I'm gonna love to read it to all the young 'uns out loud, too--jus' lemme at 'em! Here's my blog post about the contest! I would like to own this book, because the story is set in West Virginia. Since I grew up there, I find this book very interesting and would love to read it. Please enter me. Thanks for having this great giveaway. My husband has told stories about when he lived near the railroad when he was a child. He likes anything about railroads and would love this. Thanks. I would love to read this book. Apparently it is destined to be a classic! A wonderful book! Thanks for the chance to win it. Seems like the topic of trains is most intriguing to me as I have always felt a kinship with them. I would love to read this! I like that it focuses on one day in the life for each chapter! I would love to read this book because I love trains. Please include me in your giveaway. I would like to own this book to find out what all the adventures are that Jimmy has and also find out if he eventually does work on a train. I would like this because it takes place in a time long past. i would love to add this to my summer reading list. I haven't read this author before, but I am always looking for great new finds. I love reading debut authors --- and it looks like she will be an author that should be followed. We still have a very old train in our city and my son would put pennies on the tracks. Sounds like a great read. This sound like a book I'd enjoy and could share with my teenager! I love to read anything set in the WWII era. I grew up hearing stories of my mother's life during that period of history. This sounds like a book I must read. Thanks for the giveaway. I love stories of childhood and coming of age. This sounds fabulous and like a classic! I would enjoy reading this book because it is first of all about Trains, I have always been fascinated by Trains, especially passenger trains. When I was a child we took a train trip.. such fun. I also love anything form the 30's and 40's.. I have been told I have an Old Soul.. just because I am not totally modern. Hey I am blogging what more could people want from me. Thanks for the chance to win this book, I would love to read.